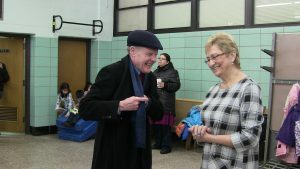 Snow didn’t dampen the spirit of a Tax Credit Scholarship celebration today at St. Mary Star of the Sea School in Chicago, as more than 250 parents, students, faculty and community members — including Illinois House Speaker Michael Madigan — showed up for the festivities. Principals of the six Catholic schools in the combined 22nd House/11th Senate districts thanked Madigan for his support of the 2017 legislation that created the scholarship program and revamped the state’s public education funding method into an “evidence-based” formula that ensures adequacy and equity. 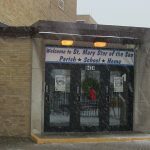 Nearly $940,000 in scholarship money was awarded to 201 area students, who are now attending St. Mary Star of the Sea, Queen of the Universe, St. Nicholas of Tolentine, St. Gall, St. Symphorosa or St. Laurence High schools. “They need the Catholic identity, structure, love, support, academic rigor and well-rounded education they receive at all of our schools,” said Kathy Berry, principal of St. Symphorosa School. 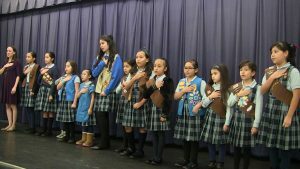 Principal Caitlin Lee of St. Gall School and members of that school’s Girl Scouts troop led the audience in the Pledge of Allegiance. The five-year pilot Tax Credit Scholarship program is marking its first year during this current school year, and has provided $57 million in scholarships to nearly 6,000 low-income and working-class students to use at private schools across the state. With four children enrolled at St. Mary Star of the Sea, Sal Hernandez is grateful for the financial help of the Tax Credit Scholarship program. The program benefits go beyond dollars and cents, he said, noting character development is a by-product of a Catholic education. 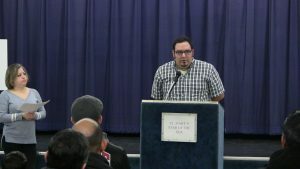 “We wanted teachers at a Catholic school to push along what we’ve been teaching at home,” Hernandez said. 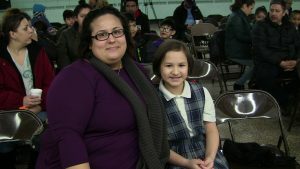 Janette Jimenez echoed his sentiments, noting St. Mary Star of the Sea provided a safe haven for her daughter Hailey Hernandez after the family moved into the neighborhood from the north side of the city. Madigan reflected upon his days as a student at the former St. Adrian School before attending St. Ignatius High School. The longtime Democratic lawmaker credited parents in the audience for making the time to apply to the need-based program. The application process for the second year of the program opens at 7 p.m. on Tues., Jan. 15. Photos, from top to bottom: Front door of St. Mary Star of the Sea School; Principal Caitlin Lee of St. Gall School and members of that school’s Girl Scouts troop lead the audience in the Pledge of Allegiance; Sal Hernandez, father of four children currently attending St. Mary Star of the Sea; Janette Jimenez and her daughter Hailey Hernandez, who attends St. Mary Star of the Sea; Speaker Michael Madigan shares a laugh with Candace Usauskas, principal of St. Mary Star of the Sea.